Paranormal has always carried a straightforward definition. It applies to all experiences that lie "outside the range of normal experience or scientific explanation." Most people understand the term well enough. About 75 percent of the people say they believe in or have had a paranormal experience. And the percentage rises even higher if you confine it to extrasensory perception (ESP). Almost 95 percent of the population believe that some people have these powers. Much less common is having paranormal experiences — ranging from deja vu to dreams that come true — to the degree that they alter a person's life. And yet, that is what happens to Tom Wallace, an exceptionally ordinary man who works in publications for a North American Aircraft plant in Inglewood. 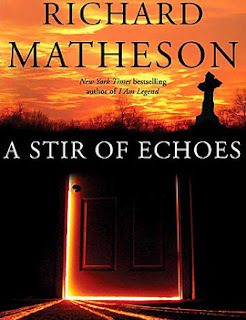 A Stir Of Echoes is an under appreciated thriller by Richard Matheson. Although originally written in 1958, A Stir Of Echoes is remarkably timeless. And although most people consider it one of Matheson's minor works when compared to I Am Legend and Somewhere In Time (originally Bid Time Return) or The Incredible Shrinking Man, the reason many dismiss this short fiction is what makes it work. Wallace is ordinary, even boring. He exemplifies the most mundane of the American dream as it could be defined in the 1950s or 2010s. He has a slightly above average job; a comfortable and stable marriage; an average family that includes a son and a second child expected soon. And they live in an average suburban neighborhood, with neighbors who have problems that are disturbing but neither shocking nor necessarily uncommon. They have desires, secrets, affairs, and animosity toward their spouses. Wallace sees it all, at first in pieces and then with growing clarity after his latent psychic abilities are unexpectedly unlocked at a dinner party. But that isn't everything that he eventually sees. There is also a ghost who is still unsettled. The subtly of the stir is what makes the story sparkle; reason over thrill. Given the pace of the plot plods compared to many Matheson books, it reads much less like a thriller than a clinical transformation, with Wallace quietly struggling to determine if his "gift" is real or more likely the early stages of losing his mind. It makes the story even more real, delving into how an ordinary person might cope with such abilities rather than being chased by them for 200 plus pages. It has creepy moments, especially early on, but remains relatively steady in its narration and reliance on dialog. Its strength, however, is that it is not a traditional horror story as much as it is a work of literature that contains a paranormal thread before paranormal was even popular. He was well ahead of time. For Wallace, the ability to read minds, foresee the future, and eventually act as a medium isn't fun, fascinating, or even welcome. It's especially worrisome because he cannot always distinguish dreams from reality or separate clairvoyance from telepathy. As the original cover teases, it's a novel of menace. It's this critical point that distinguishes the modernized 1999 movie, Stir Of Echoes by David Keopp and starring Kevin Bacon, from the original work. Whereas the movie immediately finds its pace by focusing on the ghost, the book opens different doors. The ghost can be tied to his clairvoyance or the manifestation of other people's thoughts: what they know has happened or wish would happen, or even be non-itelligent energy left on an object. Wallace doesn't know, especially because the ghost thread is given equal weight to the rest of his experiences. But what Wallace does know is that his abilities aren't something to share. When he turns to the only person he thinks he can trust, his wife, she begins to mistrust him, fearing his ability to read minds (or more accurately, emotions) and especially that he might start to read her mind. Another difference between the film and book is the weight given to a child. They are largely inconsequential in the book, more window dressing with the exception that the psychic powers are hereditary. In the movie, Wallace's son is well-attunded to his family's gift. Matheson has left a permanent mark on modern literature. Stephen King has called Matheson one of his greatest inspirations for a reason. Matheson, much like Edgar Allan Poe did for another era, concentrates on the psychological and sociological impact of his fantastical tales as much as the action that takes place as a result of them. He puts more life in his characters because you can feel the consequence of exposure as opposed to their momentary reaction to it. In Stir of Echoes, this translates into Wallace wondering how to live with these psychic abilities and profound impacts it will have on life. Even resolution won't cure him. All in all, Matheson's dozens of books, short stories, screenplays, and television shows reach further than most people know. He is especially adept at communicating complex ideas into concise, tightly packed writing (as well as his understanding of metaphysics) that is always something to appreciate. A Stir Of Echoes By Matheson Shivers At 6.2 On The Liquid Hip Richter Scale. With so much material written over his remarkable career, it would be easy enough to pick up any number of Matheson's novels for review. There is no doubt someone will. This time around, it seemed more fun to highlight one of his earlier and less appreciated works, especially because its depth is greater than most people give it credit for and its timelessness borders on uncanny. 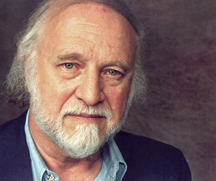 A Stir of Echoes by Richard Matheson is available on Amazon. A Stir Of Echoes can also be found at Barnes & Noble. On iTunes, A Stir Of Echoes can be downloaded for iBooks and there is an audio version. While the audio version is all right, the reading lends no real creepiness or suspense when it's needed most. Stick to the book. And, of course, for an entirely different treatment, a much more simplistic and straightforward ghost story (without relying on gore or body counts), the movie Stir Of Echoes is discounted on iTunes. The movie and book don't spoil each other. They are very different creations. I lean toward the book; the movie is average.